I’m a pretty picky science fiction reader. It’s rare for me to stumble across a single science fiction novel I fully enjoy. Beth Revis has given me an entire series that I love. I’m not going to lie. I was a little worried about the world Revis had created outside of Godspeed. I didn’t want a series I loved to end like a bad Sci-Fi movie. Revis proved that all of my worries and concerns were unnecessary. She wrote the best ending this series could possibly have. Once everyone lands on the surface of the new Earth and wake up the Frozen, the new colony is not only fighting each other, but they are fighting their new home. Every single thing they come across is an unknown. There are things on this new planet no one has ever seen before and it could be perfectly safe or completely deadly. This would be a difficult situation for any group of people, but when there is a major lack of trust between the two main groups of the colony, it will be even worse. In spite of everything put in front of them, I loved the moments Amy and Elder got to have together. Their happiness and love is a great thing to read in a Young Adult novel. They trust each other, and while there are a few moments of miscommunication, for the most part, they talk to each other. They know things won’t always be easy, but they’d rather face the tough times together than apart. I can honestly say I had no idea where the plot was going. I never knew what was about to happen next. I was constantly holding my breath, waiting for the next big thing to happen. It was the best feeling I can have when I read a book. Half the fun is in the surprise, and it’s even more fun when the planet is basically a character in its own right. 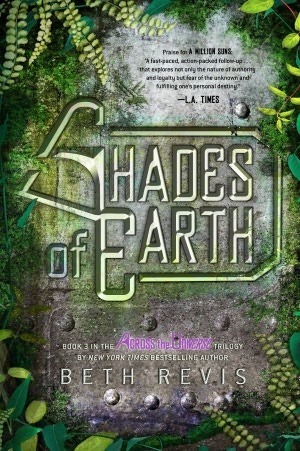 Shades of Earth is a brilliant end to a suspenseful series. I loved following the journey Amy and Elder took, from the early unfreezing of Amy to their new home on Centauri-Earth. I will certainly miss reading about their lives, but this was the perfect way to end it. The entire series is a must-read. This entry was posted in Dystopia or Post-Apocalyptic, Mystery, Thriller, and Suspence, Something a Little Different, The Must Reads, Young (and New) Adult and tagged Beth Revis, Dystopia/Post Apocalyptic, Fantasy, Must-Reads, Mystery/Thriller, Science Fiction, Young Adult.